It’s not news to any parent that children come with stuff, shed loads of it in fact. Along with the shock of just how long it could take to walk out of the front door, the sheer volume of paraphernalia I now had to cart around was the greatest logistical surprise of parenthood. This ever evolving luggage burden poses even more of a challenge to babywearers. Without a pushchair basket to use in place of a forklift truck, you have two options; cross your fingers and ‘wing it’, or find a bag that’s both large enough to contain A LOT and can be used while carrying children on your back or front. Let’s just say that I’m not exactly known for travelling light. If ever I did try to ‘wing it’, nappy explosions, injuries, sudden dire thirst, extreme weather conditions or imminent starvation are sure to follow. For the last three and a half years I’ve therefore been on a quest for a supremely functional, yet attractive bag that I could use while carrying my boys. The holy grail of babywearing bags has however been illusive. 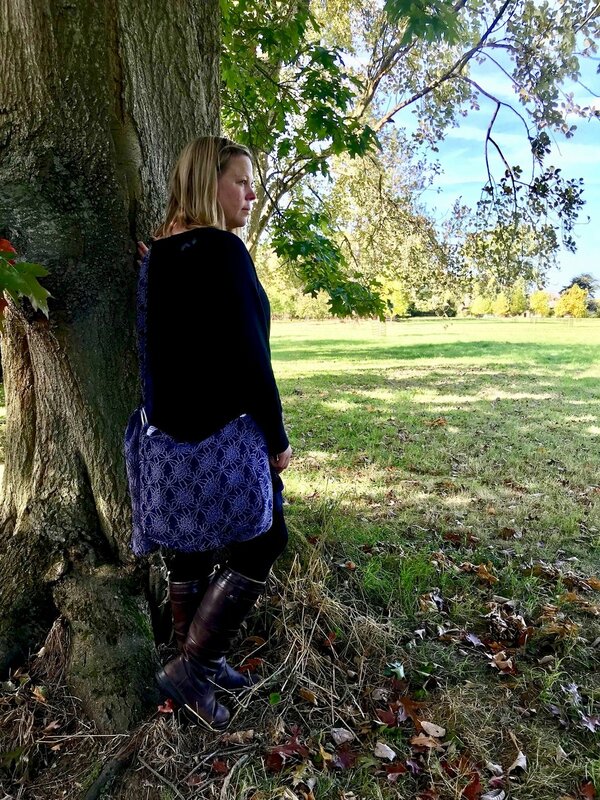 Your standard Yummy Mummy style changing bag simply slides off your shoulder (after digging in for a bit) and is way too small to accommodate your sling when your wrappee doesn’t require its services. A rucksack might work when you’re front carrying, but doesn’t exactly work when you’re back carrying, and can have a look more reminiscent of a teenage foreign exchange student expecting to be mugged than one might like. I saw the gorgeous Absolute Bobbins babywearing bags some time ago & have been wanting one ever since. Alison, the very talented lady behind Absolute Bobbins, makes them to order as well as having a selection in stock on her website (if you’re quick enough to nab one!). She’ll make them out of any suitable fabric you like but many people have them made from woven wrap fabric. I mean, if you have a stunning woven wrap or carrier, why not have a bag that’s equally beautiful right? There is however also a practical benefit from using lovely mouldable, cushy wrap fabric. Alison’s babywearing bag design has been perfected following extensive testing & feedback from babywearers. It’s large enough to carry all the usual ‘child stuff’ and has a zip at the top to prevent said stuff spilling all over the floor at inopportune moments. It has internal pockets to house phones, keys or cards so they don’t get lost in amongst the rest of the rubbish you cart around, a large flat section at the front perfect for a magazine or muslin, and even has a strap across the base that’s perfect for stuffing a child’s jumper or jacket (or even a lightweight shorty wrap) for easy access. The real magic in the design is in the wrap style strap though. Wide and comfortable, it moulds over your shoulder and around your little one whether they’re on your front or back. This spreads the weight of the bag and, when made from a cushy woolly wrap like my Firespiral Grape Twilight Fractals, really cushions your shoulder. The length of the strap is fully adjustable thanks to the sling ring fastening, and it has no buckles to dig into you or your little one. When babywearing it looks and feels like a little extra wrap pass around the two of you. Now, if you’re anything like me, you’re probably wondering whether one of these beautiful bags is actually going to be practical... they look fairly compact and nowhere near as humongous as the multi-compartment backpack my husband carts around, so I confess I feared it simply wouldn’t be big enough. I was wrong. The bag measures roughly 35cm wide, 30cm tall and 15cm deep although these dimensions stretch when the bag is stuffed. A size 4 medium weight woven wrap, two reusable nappies (I was feeling slightly cavalier as the day’s poo quota had already been met), a wet bag & reusable wipes, two fleece hat & mitten sets (because if I don’t carry them the immediate onset of the next ice age is guaranteed), two sun hats (because if I don’t have them instant heatwave is certain - gotta love the British weather), a 750 ml water bottle, my wallet, phone case, sunglasses & keys, the GP registration forms I’ve been carrying around for months in the vain hope I may remember to hand them in, and the ingeniously named Penguin the penguin. Like I said, I don’t travel light, but there was room for all this with space remaining in the top of the bag. I swear there’s some Mary Poppins bag magic going on! I had my bag made from one of my all-time favourite wraps. It started out as a long size 7 and came back as a long 3 after the bag had been made from the rest, so I still have a lovely shorty to use. Alison guided me through the whole process giving advice on what kind of fabric might be best, which sling rings & zip would be used, and which fabric I wanted for the lining. She patiently suggested different options until she found the field mouse print I fell in love with. If you’re thinking of converting a much loved wrap, or shortening a long one, Absolute Bobbins provide a personalised service that’s guaranteed to result in a bag that’s perfect for you. Despite the name, these bags aren’t only for babywearing either. Unlike a standard changing bag, an Absolute Bobbins bag will go on to be extremely useful & beautiful long after your wrapping years. I absolutely adore mine. It’s the perfect combination of well thought out babywearing functionality and relaxed beauty. Handmade to your specifications, an Absolute Bobbins babywearing bag is a perfect way to ensure your favourite wrap stays with you forever. Follow Absolute Bobbins on Facebook for her latest news and stock alerts. You can view her available in stock bags on the Absolute Bobbins website.